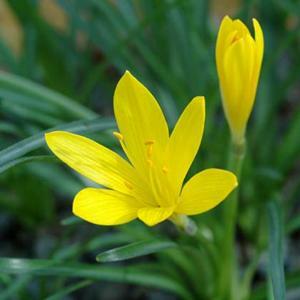 Small autumn-flowering bulb producing delicate funnel--shaped bright yellow, crocus-like flowers with long tubes and narrow petals. Strap-shaped, grey-green leaves. Prefers good sunlight and sandy well-drained soil. Drought tolerant when dormant. Can be grown in containers in an alpine house. By separating the small bulb offsets.